Last week, a long awaited change happened in my heart–something formed from lots of “how-do-I-handle-this?” conversations with God. It was a tiny change in my character development (only a handful of people probably noticed), but it reminded me again of this simple, beautiful thought: I am God’s masterpiece—a ever-changing work of art on display in this world for His glory. And friend, so are you. Don’t believe me? I don’t blame you. Most days “masterpiece” is hardly the way I’d describe myself either! Instead, every tiny flaw seems to jump out at me. I want to nit-pick the imperfections and ugly, scarred areas. My soul becomes weary from pushing on through the struggles, and I want to run away from my troubles and not let them “perfect” me (James 1:2-4). When I look at the tragedies and the everyday bumps and bruises, I don’t want to believe that “all things work together for those who love God and are called according to His purpose” (Romans 8:28). Some days (as I watch my troubles mount to an almost unbearable weight on my shoulders) I just want to be taken away to somewhere quiet where I can be left alone for the next month with my journal, a cup of tea and a great book. But thank goodness that our life’s foundation doesn’t have to be based on the fluctuations of our feelings or even the reality of our circumstances. Thank goodness that God sees through the nastiness of our world (both our difficult circumstances and our selfish desires) and somehow, someway transforms them into a breathtaking cascade of His glory. Yes, friends, sometimes we can step back and look beyond the everyday trials and see the masterpiece slowly taking shape. And that makes all the uncomfortable shaping worth it. I recently shared about this experience–of how we are ALL God’s masterpiece–at My Joy-Filled Life. I gave seven truths about masterpieces, included lots of scriptural insight, and spoke about how today’s trials are part of the Master Artist’s plan to mold us into His amazing vision for our lives. Check out the entire post here, and be encouraged. 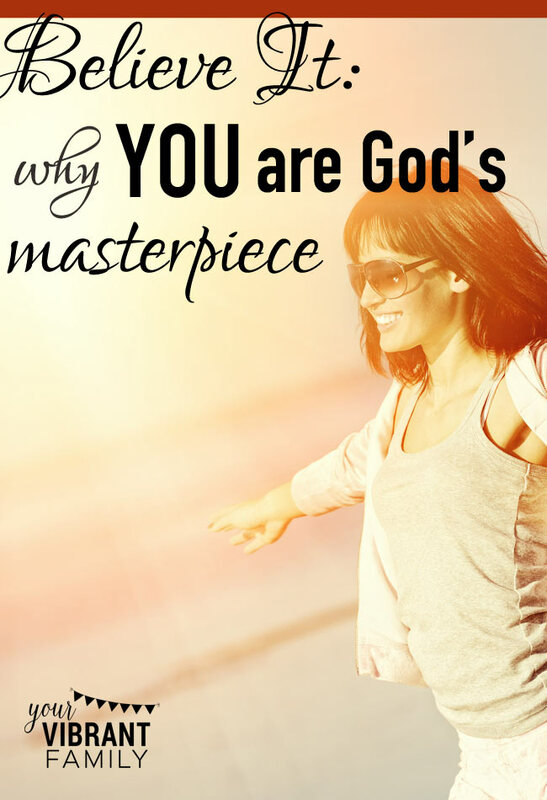 Discover why, yes YOU are God’s masterpiece!